Cook Islands prop Adam Tangata has been cleared to play in Halifax’s Championship opener at Whitehaven next Sunday (3.0). Tangata, who joined Fax from Sydney club Mounties in the autumn, had been waiting for final work permit clearance. 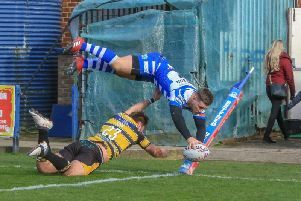 Government officials have now given the front rower the green light, although it remains to be seen whether that will be enough to prompt coach Richard Marshall to pick him for the trip to Cumbria. Tangata has not played since the end of the Australian season, while his former teammate Mitch Cahalane, Luke Ambler, Richard Moore, Jack Spencer and Andy Bracek have all staked strong claims in the pre-season fixtures against Hull KR and Huddersfield.